"Higashiyama Sakura Zôshi" was premiered in the 8th lunar month of 1851 August at the Nakamuraza [casting]. The true incident on which the play was based occurred in 1653 (the direct appeal). When it was dramatized, the names and details, even the era (Muromachi instead of Edo), were changed because of censorship by the shogunate government. For example, the head of the village Kiuchi Sôgo, the evil lord Hotta Masanobu and the shôgun Tokugawa Ietsuna became Asakura Tôgo, Orikoshi Masatomo and Ashikaga Yoshimasa in the drama. Segawa Jokô III mixed in his drama the farmers riot and elements taken from Ryûtei Tanehiko's popular novel "Nise murasaki Inaka Genji" (commonly called "Inaka Genji"). This drama was revised by the playwright Kawatake Shinshichi II. He got rid in his version of the "Inaka Genji" elements. It was staged in the 8th lunar month of 1861 at the Moritaza [casting] under the title "Sakura Sôshi Gonichi no Bundan". The drama was revised during the Meiji era and the real names of the main protagonists were used instead of the names created by Segawa Jokô III. The drama "Sakura Gimiden" is made up of 7 acts. The usually-performed acts are III (the family separation) and V (the direct appeal). "Sakura Gimiden" is an unusual Kabuki play about political protest. In fact it is the only play of its kind, and concerns the plight of farmers subjugated and squeezed dry through crippling taxes imposed on them by corrupt, money-hungry samurai officials. The hero of the story is Kiuchi Sôgo, the mayor of the village of Sakura in what is now Chiba prefecture, and his character is based on a historical figure of the same name. The basic premise was rather simple. Farmers in 17th century Edo had banded together to protest the harsh treatment of the Hotta overlords. The behavior of the members of each social stratum was strictly controlled by the shogunate government and it was forbidden for commoners to appeal to higher authorities, irrespective of the merits of their case. However, the poverty in Sakura is so desperate that the mayor, Sôgo, decides to appeal to the shôgun although his action will automatically mean the death penalty for not only himself but also his family members. Sôgo visits his family for the last time and his children cling to him and try to stop him from leaving. Sôgo is a loving father, torn between his desire to stay with them and his commitment to leave and see his duty through to its fatal end. In order to spare his family he gives his wife divorce papers, but she refuses to accept them and chooses to die with him. Sôgo succeeds in sneaking into the Kan'eiji temple and runs to the procession led by the shôgun Tokugawa Ietsuna. 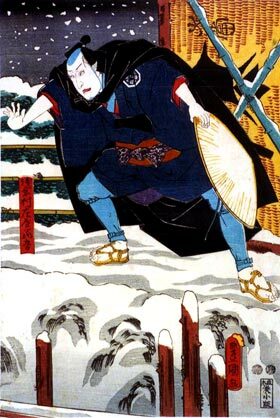 Guards rush to capture him and his appeal letter is taken by the daimyô Matsudaira Izu-no-Kami, who pretends to throw it away but secretly hides it in his sleeve in order to give it to the shôgun later on. Kôzen is the old, emaciated abbot of Bukkôji Temple, and Sôgo's uncle. He has been praying fervently for 37 days for leniency in the case, but when news comes that Sôgo and his wife were forced to watch the decapitation of all four of their children before being crucified themselves, his rage transforms him into a demon. In the next scene, the ghosts of Sôgo and his wife, and of Kôzen seem to haunt Lord Hotta and he lashes out killing his own sister and a visiting priest by mistake. The final scene depicts the 100th anniversary of Sôgo's death at which both Sôgo's and Hotta's descendants are reconciled, Sôgo is honored and a temple is ordered to be built in his name. It is a well-established custom for actors about to perform the role of Sôgo to visit the descendant of the Kiuchi familly and the temple where Kiuchi Sôgorô is enshrined, in the city of Narita (Chiba prefecture). During the run of the play a temporary shrine is erected within the theater before which daily offerings are made. 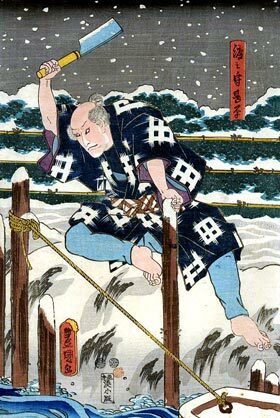 (*) the boatman Jinbei ferries Sôgo to his home in defiance of the local edict. He is a warm character, who at his age doesn't really care if he's caught and given capital punishment by the authorities; he'd rather help his old friend see his family for the last time.